Stafforce Dumfries won their CricHQ40 Cup group match at Ayr on Saturday after a dramatic Ayr collapse in the second innings. The RS Byers Engineering Man of the Match Davie Davidson (sponsored by the Sports Club Domino School!) scored 35 not out and Chris McCutcheon added 23 not out, batting at number nine, which revived the Dumfries innings for a final total of 119 for 7 after the 40 overs. In reply, Ayr looked very much in control at 56 for no loss. However, pace bowlers Alan Davidson and Niall Alexander then ripped through the batting line-up as they each took four wickets. Remarkably all ten wickets fell for just twenty runs for Ayr to slump to 76 all out and a Dumfries victory by 43 runs. This Saturday, after two wins, Dumfries play the deciding group match against Prestwick at home. On Sunday they play Poloc in the Scottish Cup, also at Nunholm. Alexander was in the wickets again on Monday when he took 3 wickets for 23 for the Border Reivers in their 52 run win over the Dutch Hurricanes in a 50 over Pro Series encounter in Glasgow. 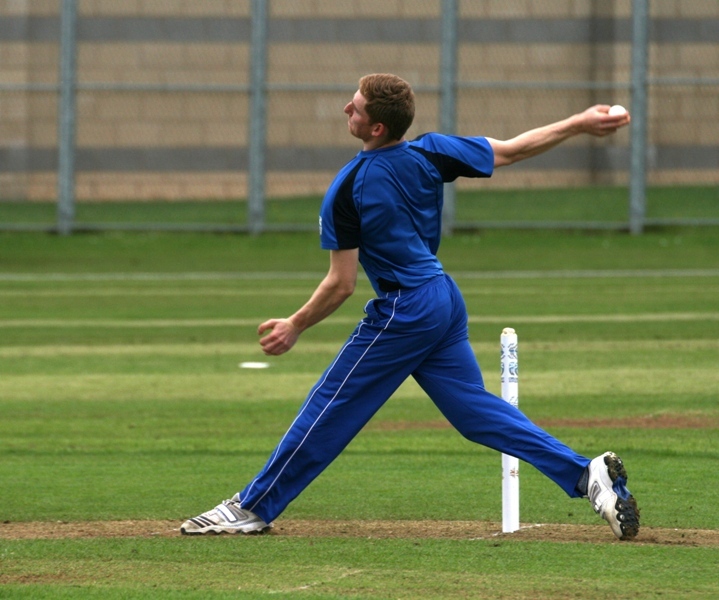 Scott Beveridge also took three wickets and boosted the Reivers up to 236 with a hard hitting score of 33. Beveridge had figured in the previous day’s Twenty20 victory taking two wickets and captained the Reivers to an eight wicket win chasing a total of 117. Also on Monday, Dumfries’s Kirsty Strachan played for Scotland Women in their six wicket County Championship win over Hampshire after a defeat to Northants the day before. Junior coaching sessions are underway at Dumfries Cricket Club for the summer on Mondays, 6:15-8, for boys and girls, suitable for ages 8 to S2. For details contact Trefor Williams on 01387 256455, or the club on dumfriescricketclub@gmail.com or 07799 856094, or come along to Dumfries Sports Club, Nunholm on the night.